This entry was posted in episodes and tagged ahnnu, asap rocky, curtis williams, episodes, fatkidsbrotha, frankenstein, gucci mane, ham-r, kubota toshinobu, rau def, slack by dex digital. Bookmark the permalink. Good mixtape man, as per usual. I can’t tell you how many times I’ve left like just leaving work and listening to some music or relaxing but anyway, all the tracks on there were good man. I see most of them were pulled from other mixtapes. I think I might take a look at those too. In the meanwhile, I don’t know if you got a chance to take a look at Shin Sight Trio. In my view, they’re something to watch but I’d like to see what you think of them. As well as that, I’ve been turning my attention to the UK grime scene which seems to be growing by the second. I’d say, recently, there are two I’m listening to a lot. The first, with Giggs and Kano and the second a little more recent by Fem Fel who, again, I think is one to watch. Anyway man, let me know what you think of those tracks and I’ll comment back later. I love your header! Makes me smile. Saved a screenshot of it in my “inspiration” folder. 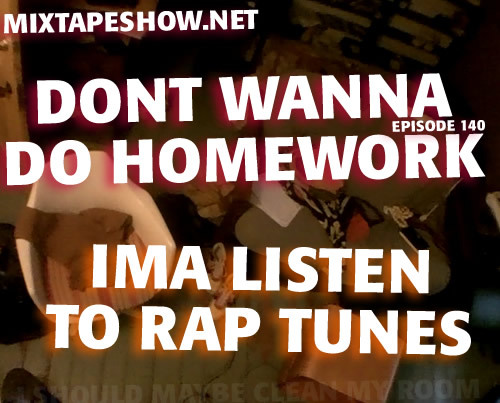 Man I cant believe i still listen to mixtapeshow.net. I’ve been following you since the 7th grade I’m in 11th now that’s crazy. Keep posting! U – as always, super late, my bad. those first and last tracks ain’t bad. looks like you’ve been doing homework. I haven’t really been checking grime recently at all, but looks like this Fem Fel dude might be someone to pay attention to. It’s a little unfocused, but the beat kinda goes hard. vilhelm HAHA. I’m not sure what that would ‘inspire’ you to do, but thanks. Loser whoa SWAG. i can’t believe you’re still listening either. thank you fam, that means a lot. i’ll keep posting if you keep listening. Suggestion: time mark next to each track on list. hey dex… ive been following your show for a long while now too. Ive listened to every episode i think. just wondering how i download this new format. listened to the first few minutes of your most recent tape already and its dope. keep up the great work. good luck on all those papers hahaha. yo, I just added the subscribe links up on the top right. If that doesn’t work for you, let me know. as for individual episodes, I forgot to add links. I’ll do that now.